Opticoelectron Group is a leading company in optical engineering solutions for military use. The company has been operating in the marketfor more than 40 years, making it one of the most influential optical producers across Bulgaria and Eastern Europe. Opticoelectron Group specialises in the design, manufacture, and trade of optomechanical and optoelectronic devices and systems, optical components and assemblies, precise mechanics, as well as shape forming tools and appliances. The company’s premises is built on 260 000m² terrain formed as an industrial park and has manufacturing areas of 108,000m². In recent years, the company has focused its engineering and production activities on optical sights for day and night-vision, thermal imaging equipment, as well as short-wave infrared (SWIR) technology. Opticoelectron Group concentrates on two separate sections of the market; optics for military needs, and optics for civilian needs. For military needs, the company produces anti-aircraft and ground artillery sights for fire in day and night. It also supplies day and night optical sights for fire arms, thermal imaging, and mobile systems for surveillance of large fields, as well as SWIR lenses and infrared laser target designators. For civilian needs magnifying glasses, illuminators and microscopes, are produced, as are devices for educational purposes, medical equipment, and technological equipment on the basis of unique Bulgarian inventions. Opticoelectron Group has a high technological capacity, which includes both technology and equipment for manufacturing of details, assemblies, and micro-optics made of optical glass, crystals and semiconductors. It uses technologies and computer numerical control (CNC) equipment for precise machining of metals. Production of precise mechanical elements and assemblies technologies is also handled by the company and it produces specialised technological and test equipment for assembly of optomechanical and optoelectronic devices and systems. In last few years Opticoelectron Group has been trying to develop its optical production in the field of mobile surveillance systems, thermal imaging, and SWIR. One of the firm’s most important projects is the mobile surveillance system MUSON 12. It is designed for day and night monitoring and observation covering a wide area, by using cars light trucks and medium trucks. MUSON 12 system was created to serve the ground defence strategy of the Republic of Bulgaria under the project Green Border. SWIR product series comprises the Swirecon 14, Swirecon 25, Swirecon 50 and Swirecon 100. The lenses have an athermalised design for harsh environments and are a compact size with low weight. Opticoelectron’s SWIR lenses are specially designed and coated for a high resolution. 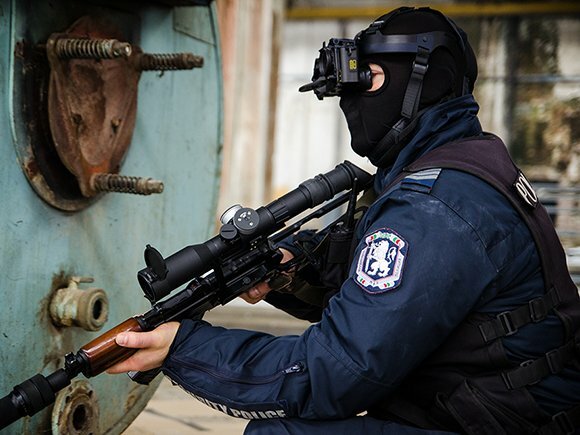 SWIR lenses also have many other uses such as perimeter surveillance, border and port security, driver vision enhancement, as well as muzzle flash detection. They also provide imaging through fog and dust and 24-hour day and night surveillance. The TERECON TS 50 thermal sight is designed for weapons up to 50 calibre (12mm, 7 mm) with interface MIL-STD-1913 and battlefield monitoring. The device is suitable to be used by the special forces, army, and police. It provides clear and sharp images of the battlefield, regardless of the weather, increasing the operational efficiency and precision of the staff as its security. The Thermal vision attachment TCO is designed for daily use with optical sight electro-optical systems (EOS) 1.5x for antitank grenade launcher, RGW-90. The thermal imager provides a clear and sharp image of the battlefield, regardless of the weather, increasing the operational efficiency and precision of the staff as its security.